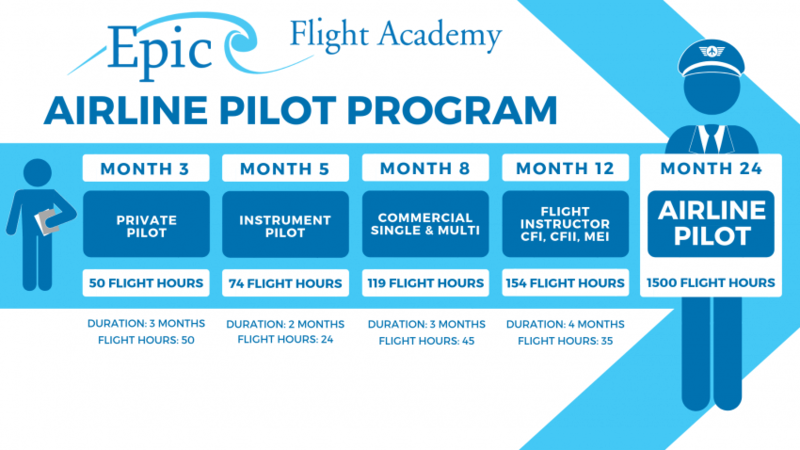 Epic’s Airline Pilot Program is intended for U.S. (domestic) flight students that are seeking a career as a commercial pilot; foreign students should review our International Airline Pilot Program. With the growing worldwide airline pilot shortage and the minimum 1,500 hour requirement in the U.S., most of our U.S. students choose to become a Flight Instructor to build flight time. (International students typically are required to have only 200 or 250 hours in their respective countries.) However, we do offer individual and customized training for students pursuing other professional pilot career opportunities. If you have questions about which program is best for your aviation career goals, contact our Admissions Team directly to determine which flight courses best suit your needs. With airline pilot salaries soaring, there has never been a better time to pursue your dreams! Financing options are available. Students from all over the United States and more than 80 countries choose Epic Flight Academy for pilot training in order to pursue their aviation career dreams. Our pilot school began flight training in 1999, and thousands of Epic Professional Pilot graduates are thriving today in their aviation careers with more than 300 airlines worldwide. Learn to fly with us!